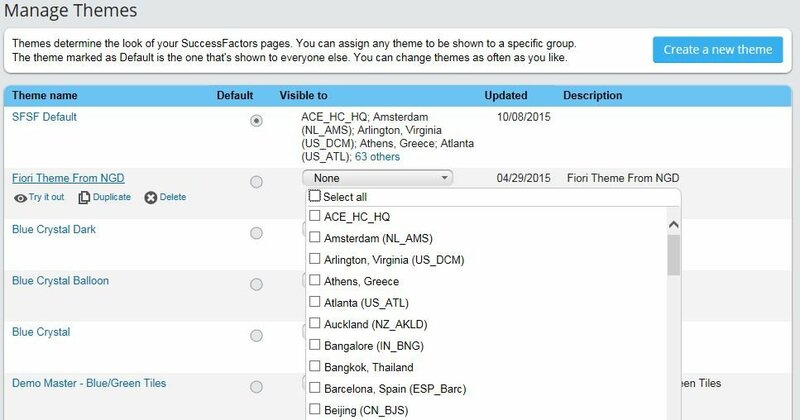 Do you know the options for dynamic branding of your SuccessFactors user interface? Most customers are aware that the design / branding of the user interface can be changed to match their organisation’s corporate design. When working in the theme manager they would also realise that different designs can be assigned to different divisions. But many are unaware of the options for themes by location or department. That’s because the division is the default object available in the Theme Manager for customer users in the Admin Center (under Company Settings). Switching to other criteria for the design choice requires provisioning access, so SuccessFactors customers wouldn’t be aware of the options, unless their service partner points it out to them. In provisioning, searching for „themes“ under company settings brings up exactly one entry, where you’ll see the default set to „division“. Depending on your branding requirements, one global theme might be enough or you go for one scheme per division to reflect different brands. Department or Location seem a bit excessive as differentiators, but it always depends on your context. If you want to emphasise a strong relationship with the local community, one theme per location might just be right, so you could add a landmark picture of each location for a local flavour in your branding.